Yesterday I was honored to speak at the mid-year graduation ceremony at Eckstein Hall. Twenty three graduating students and hundreds of friends and family came together with Dean Kearney, faculty and administrators to celebrate the event. What follows are my prepared remarks. Dean, fellow faculty, invited guests, and most importantly, December graduates. I am honored to be with you on such a momentous day. Class of 2014, today is the day that you thought would never come. Today is the day that you embark on your legal careers. Even in normal times, the transition from law school to practice can be an anxiety-inducing event. But these are not normal times. The practice of law has been undergoing significant change in recent years. Venerable old law firms, with names over a century old, are disappearing, through merger and bankruptcy. It seems that lawyers are better known for their television commercials than for their legal arguments. And the basic day to day legal work that law firms have traditionally relied upon to meet their overhead is now being outsourced offshore to cheaper lawyers in New Delhi and Manila. I doubt that someone of my generation can even understand the challenges that you will face in your future careers, much less presume to offer you any advice on how to meet those challenges. Let me give you some idea of how the practice of law has changed over the last quarter of a century. When I graduated from law school in 1988, I went to work at a large law firm (at a job that I expected to have for my entire career). I wrote briefs in longhand on yellow legal pads, and gave the sheets to a secretarial pool for typing. And if I wanted to do any online legal research, I had to go to the firm’s sole designated Lexis terminal, which was located in the law firm library and which was hardwired via phone line straight into Lexis headquarters (because there was no such thing as the internet). The only thing that I know for sure is that you will witness similar fundamental changes in the legal profession over the next 25 years. Your challenge, however, is to embrace the new, and to roll with the changes, without ever losing sight of the core values that underlie our profession. My message for you today is not about the way in which our profession has changed, but rather about what has remained the same. I want to address one fundamental characteristic about the practice of law that has persisted, unchanging, from the very beginning of our profession. I would like to share with you a story that comes from the period around the fall of the Roman Empire. 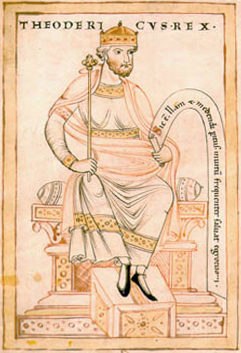 The event took place during the reign of King Theodoric, known as “Theodoric the Great,” who ruled the Ostrogoths in what is now Italy in the second half of the 5th century. What can we learn from this story? Well, for one thing, it seems that as long as there have been lawyers, there have been complaints about overbilling. For some commentators, the sin of the lawyers executed by King Theodoric was the sin of neglect. This story is used to illustrate the axiom that “justice delayed is justice denied.” In fact, in one version of the story contained in a history of Roman law, the length of Juvenalia’s lawsuit is given as 30 years, not three years. This variation of the story serves to underscore the length of time that Juvenalia has had to wait for justice. But for me, this is not a cautionary tale about lawyers neglecting to give priority to their client’s case. I don’t think that the length of time that has passed is what makes the lawyers’ conduct objectionable. When I think about this story, I keep coming back to King Theodoric’s question to the lawyers: “Why did you not do in three years what you have just accomplished in two days?” For me, this question gets right to the heart of whether the lawyers have done their job. The King doesn’t care about the merits of Juvenalia’s case, or which party in the lawsuit is in the right. The King is upset because the lawyers had the training and the capability to solve the problem, but for whatever reason they had failed to come up with a solution. The lawyers were hired to be problem solvers, and they failed utterly and completely at their job. Maybe the lawyers saw their job differently from King Theodoric. Maybe they thought that their job was to be a warrior for their client, and that a vigorous fight was more important than an amicable solution. Maybe they were more cynical, and thought that their job was to live off of their client’s problems, always looking for new complexities and new wrinkles in the case that would justify more fees. Even today, there are those people who think that the job of a lawyer can be reduced to being a warrior/advocate or else a self-serving rent-seeker. I’ll admit that being a lawyer can involve playing the role of the warrior at times. And I am realistic enough to admit that our profession does sometimes profit off of the misfortunes of our clients. But neither of these characteristics define the core of what lawyers do. Did the lawyers deserve King Theodoric’s harsh punishment? You have spent your time at Marquette University Law School learning statutes, memorizing precedent, and studying the rules of professional conduct, but you don’t need any of that knowledge to understand the merits of Juvenalia’s complaint. Even sitting here in this room today, thousands of years later, our instincts tell us that King Theodoric was right to be angry with the lawyers. Juvenalia had hired the lawyers to solve a problem, and the problem was still right there staring her in the face. Nothing had changed. Sometimes our complex and evolving world obscures the most basic truths from our sight. It is undeniable that the legal profession is very different today than it was in King Theodoric’s time, or even when I graduated from law school. But we can still recognize some things that have remained unchanged. You knew the vital role that a lawyer plays in our society before you even entered this beautiful law school building for the first time, and I hope that we faculty haven’t done anything over the last several years to confuse the matter. Clients will come to you with their problems, and your job will be to solve those problems. It really is that simple. No matter how much the legal profession changes, this will always remain the lawyer’s true calling. If you are not solving problems, then you are not doing your job. Sometimes people complain that there are too many lawyers. But no one complains that there are too many problem solvers. As you go forth today, I hope that you will embrace the role of problem solver and make it your job description. Your education at Marquette University Law School has prepared you for this task. People will bring their problems to you, seeking your assistance. And when you find creative and dispositive ways to relieve them of their problems, your clients will be extremely grateful. This is what makes the practice of law a noble profession, and it is also what makes the job of a lawyer so satisfying. Sometimes, you will even get paid. And so, Class of 2014, as you face the ever-changing future, never forget the essence of what it means to be a lawyer. Remember the lesson of King Theodoric. And whatever happens, keep your head about you. * A version of this story appears in John George Phillimore, INTRODUCTION TO THE STUDY AND HISTORY OF THE ROMAN LAW 280, footnote a (1848). Theodoric the Great is not to be confused with Theodoric of York, Medieval Judge, a character portrayed by the comedian Steve Martin on Saturday Night Live. It is true that there are many good lawyers that are problem solvers. It is true that King Theodoric’s reaction to his question was harsh. However, he did his job by disposing of two problem creators. Theodoric could also be impatient with philosophers, witness his beheading of Boethius, his former adviser and the author of The Consolation of Philosophy. At the time of his death, Theodoric was also about to launch a major persecution of Roman Catholic Churches in his realm in retaliation for their persecutions of Arian Christians, with whom Theodoric sympathized. Previous Previous post: Grilling By Judges? It’s Not Just for Moot Court.